Sometimes love really is worth fighting for, but picking your battles isn’t so easy—especially when lives are at stake. Personal tragedy and the loss of both parents at a young age madeAriela Perrine cross self-sacrificing hero types off her datable list. ButAriela is literally swept off her feet when an accident brings her face to face with an unforgettable pair of blue eyes, a playful smile, and an overly affectionate dog.Oh yes, journalist Dylan Bond makes her sizzle, but dare she risk it? After all, he’s just returned from covering conflicts around the globe. With his assurance he’ll be handling domestic stories from now on, Ariela’s weak resistance crumbles and their relationship intensifies at a dizzying speed. Then an unexpected phone call lures Dylan back to Iraq and he falls off the radar. His disappearance will test them both in ways neither expected. Will it bring them closer or destroy their fragile peace forever? Dylan chuckled and drew his hand out from under her hair, caressing her cheek before returning it to the wheel and signaling his turn. Ariela had described the unsettled feeling Dylan gave her as a tornado, but now she wasn’t sure that was the right comparison. A tornado was loud and violent, certainly, but after careful consideration, that seemed too dry. No, this was closer to a tsunami or hurricane churning through her insides because there was moisture, a great deal of very unmistakable moisture to go along with the roaring in her ears and the rumbling in her chest. As they climbed the staircase, her footsteps felt springy, buoyant on the treads. It was as if her legs were pogo sticks. Did he feel any of this? Could he tell she was lost in a maelstrom he’d set off? Inside the apartment, Dylan allowed her just enough time to hang up her purse before he caught her around the waist and turned her in his arms. There was something in his eyes, those luscious, blueberry eyes, that sent tension vibrating along her spine. For a fraction of a second, he simply looked at her with just a hint of a smile. Then he moved on her, decisively, closing the space between them. Ariela looped her arms behind his neck and held on, perfectly ready and willing to be plundered. Her feet left the floor at the same time their lips connected and suddenly they were collapsing on the couch. Dylan’s hand protected her head down to the cushions. That simple, thoughtful act undid her. Ariela kissed him long and hard, rewarding his consideration. “So do you,” he growled, diving at her throat. That was it—she was his if he wanted her. What an easy conquest she’d turned out to be. She couldn’t even summon up disappointment in herself. The reality was, she’d never wanted anything, anyone more, and it was no use fighting it. With a groan, he crushed his lips to hers and Ariela felt a slight sting against her teeth. Then his tongue ventured out and soothed the pain away. Now his kiss mellowed from one of heated urgency to a calmer, solid claim. He had a right to be here, to possess her, because she’d granted it. Ariela wanted to feel Dylan’s hard body against hers, but she realized he wasn’t a guy to take without invitation. Even now, if she changed her mind and asked him to stop, he’d do it, no matter how difficult it was to pull back. Confidence in that made her want him even more. This would be an utter surrender, an open agreement with an occupying force. She fumbled with the buttons on his shirt while he held himself over her, working her top up with one hand. “How many times do I have to tell you? At this time, you’re on my banned substances list.” Ariela swept his shirt apart and ran her hands over his chest, squeezing his yummy pecs. I write stories I like to read–contemporary romances with identifiable characters and themes. Life is hard. Love makes it bearable. If you enjoy stories with heat and humor, I have a title for you. I’m a pampered wife, lucky mom to three amazing sons and one wonderful daughter-in-law, and I recently became a very young grandma. I should probably underline the word very. Oh heck, why not the word young too? Nah, you get the picture. I’m also the daily monitor of one naughty dog with attitude. Tara is giving away to a lucky winner a choice of eBook from her backlist. 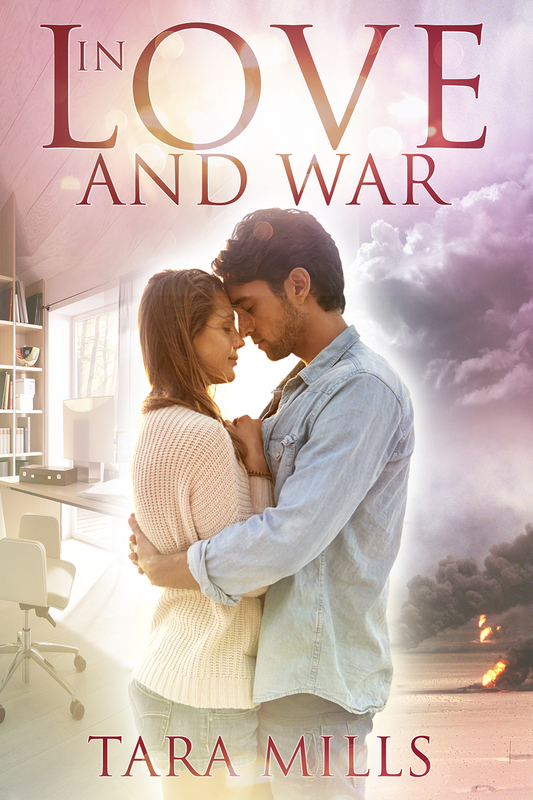 Thank you for sharing In Love and War with your readers and fans.